When people come together, they can achieve great things. 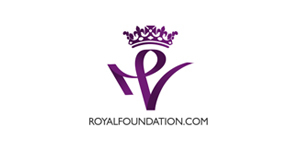 The Royal Foundation unites people to tackle some of today's biggest challenges. The Royal Foundation of The Duke and Duchess of Cambridge and The Duke and Duchess of Sussex is the Principals’ primary charitable vehicle, and hopes to become a leading philanthropic investor, effectively using its time and resources to create lasting change in targeted areas and geographies. The Foundation programmes currently focus on four main themes of work: mental health, wildlife and conservation, young people and the armed forces community. The Foundation focuses on projects that reflects the interests and passions of the Principals – bringing sustainable change to issues that matter to society. The Gift Fund raised over £1million for the twenty six charities personally chosen by Prince William and the then Miss Catherine Middleton, following the announcement of the Royal Wedding. The Duke of Cambridge launched Cyberbullying Taskforce, which will bring together the commitment, talent and expertise of the technology industry to tackle cyberbullying and the terrible effect it has on children. United for Wildlife has launched a free online course to engage with young people and future conservationists. “Introducing Conservation” is a Massive Online Open Course aiming to inspire and connect young people around the world (Learn.unitedforwildlife.org). Early evaluation shows the course is well on its way to its target of 10,000 young people gaining their first qualifications in conservation. There have been site visitors from 188 countries, with learners from Tanzania, India, Kenya and Columbia. Over four days of intense sporting action in London’s Queen Elizabeth Olympic Park, 400 competitors from 13 nations around the world competed in nine sports in five venues. Tens of thousands of people returned to the Olympic park venues, this time to cheer on people who had made massive personal sacrifices on behalf of their countries. The Royal Foundation has supported ARK to improve secondary education in impoverished communities in Uganda, where less than 25% of children are able to attend secondary school.